Palm Beach REIA Learn & Network Lunch Meeting at Palm Beach Airport Hilton. Hope to see everyone out there, remember to bring plenty of business cards for networking. This is a FREE event just simply pay for what you order food/Drinks. Boynton Beach Lunch Meeting By: Palm Beach REIA Learn & Network Lunch Meeting at Carolina Ale House. Hope to see everyone out there, remember to bring plenty of business cards for networking. This is a FREE event just simply pay for what you order food/Drinks. Free Picnic @ Okeeheelee Park located @ 7715 Forest Hill Blvd, West Palm Beach, FL 33413. 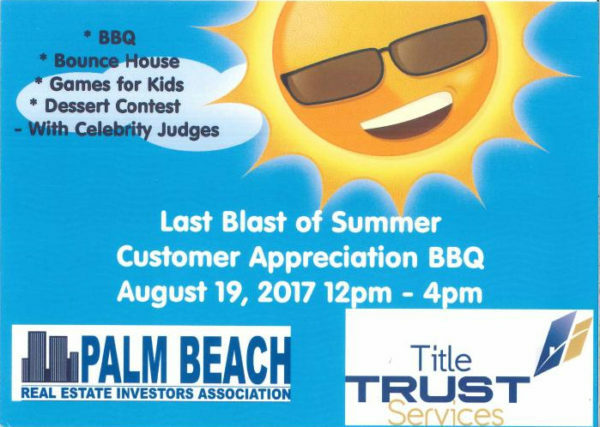 This is our Annual Event Done With Our Favorite Title Trust Services. Hope To See You All Out There On Saturday 08/19/2017, Again This Is A Free For All Event. Vendors Are Welcome To Come As Well. 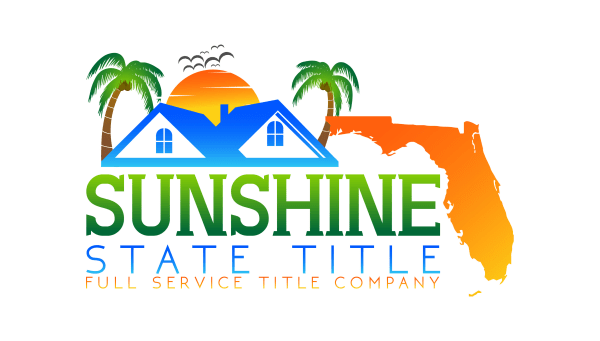 This is a joint venture from Palm Beach REIA and Title Trust Services. Doug Grady has been studying and teaching the pathways to personal potential for over 20 years. He is a graduate of Tulane University where he majored in political economy. After four years in the insurance business he began his career in the personal and professional development industry. 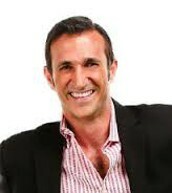 Doug is a professional speaker, musician, and President of High Achievers. He is the author of The Ripple Effect. His companies, writings, trainings, and music are designed with one purpose: to help people reach their God-given potential. Doug gives a significant portion of his time and money to local and global causes. He has been on several mission trips, most recently to Ecuador where he was part of a twelve man team building homes for the poorest of the poor. Doug also wrote The (unofficial) Tough Mudder Song after participating in his first of five Tough Mudders. Meet Frank McKinney, a true modern day Renaissance man: Real Estate Artist, 6-time International Bestselling Author (in 5 genres), Philanthro-Capitalist, Ultramarathoner, Actor, and Visionary who sees opportunities and creates markets where none existed before. Upon attending his 4th high school in 4 years (he was asked to leave the first 3), Frank earned his high school diploma with a 1.8 GPA. Then, with $50 in his pocket and without the benefit of further education, Frank left his native Indiana for Florida in search of his life’s highest calling. Now, Frank creates real estate markets where others fear to tread. He has built oceanfront spec homes (homes built without a buyer) valued in the tens of millions of dollars, shattering price records with each new project. Frank started with a $50,000 fixer-upper home, and climbed all the way to a $50 million oceanfront mansion! Frank’s latest creation? His “19 Tropical” – McKinney’s totally new concept in ultra high-end homes was just unveiled and is taking the luxury real estate world by storm (visit the link to see a tremendous amount of international media coverage)! The Frank McKinney brand has captivated the media and public for over 25 years. His vision and risk-taking have been the subject of numerous international television, radio and print features including Oprah, ABC’s 20/20, cover of USA Today, CBS’ The Early Show, FOX, CNN, Discovery Channel, Travel Channel, HGTV, The Wall Street Journal, NY Times, Fortune, Barrons, and in over 2,000 additional TV and print stories. 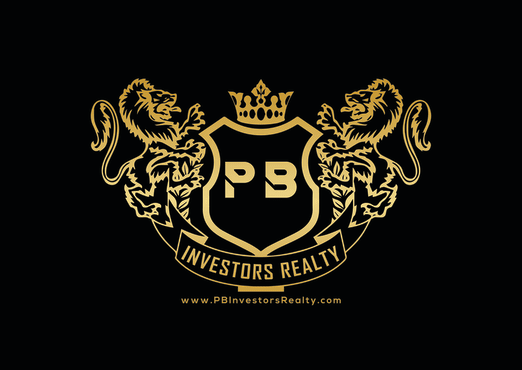 On Wednesday October 24th, 2018 The Palm Beach REIA Monthly Meeting Will Be A Panel of Experts… Here to answer any questions you may have we will have everyone from: Lawyers, Lenders, Marketing & Branding Experts, Wholesalers, Investors. This panel will explain new techniques and ideas and are also here to answer any questions you have. Hope to see you all out there Wednesday September 26, 2018 @ The WPB Hilton. Mr. Valeche graduated from Yale University with a Bachelor’s degree in American Studies. Upon graduation, Mr. Valeche entered the US Navy flight-training program at Pensacola, Florida. On completion of training, he was assigned to Fighter Squadron 191 at NAS Miramar California. During this tour, he flew 85 combat missions in Vietnam, logged 230 carrier landings and received six awards of the Air Medal. After his service in the Navy, Mr. Valeche attended the Wharton School, where he received an MBA in Finance and received Director’s List recognition for academic achievement in both years of the program. Following graduation, he moved to New York and began a ten-year career as an investment banker with Lehman Brothers, Merrill Lynch and Smith Barney. As an investment banker, he advised many public and private companies in conjunction with debt and equity issuance, mergers and acquisitions and strategic recapitalizations. Hal moved to Palm Beach Gardens in 1993. Since then, he has started and operated several successful businesses, served as head of acquisitions for a Boca Raton-based public company and is currently working once again as an investment banker and venture capitalist. He has a daughter, Claire, born in December 1998. Mr. Valeche was elected to the Board of Supervisors of the Northern Palm Beach County Improvement District in 2002 and subsequently was elected and served two terms on the City Council of Palm Beach Gardens. In November 2009, Florida’s Governor appointed Mr. Valeche to the Board of Directors of Enterprise Florida. He served as chair of Enterprise Florida’s Technology, Entrepreneurship and Capital Committee, and on the boards of Space Florida, BioFlorida, and the Florida Institute for the Commercialization of Public Research. Mr. Valeche was elected to the Palm Beach County Commission District 1 seat in November 2012, and was re-elected to a second term in November 2016. Dorothy Jacks was elected as Palm Beach County’s Property Appraiser in 2016 after a distinguished 28-year career in the office. 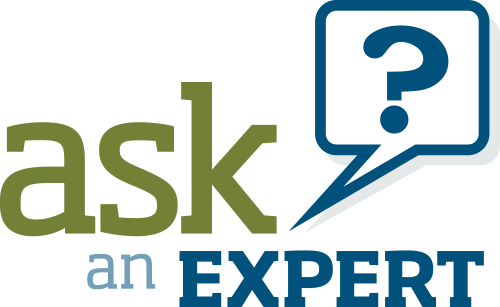 As a Certified Florida Appraiser and Assessment Administration Specialist, she has the highest professional designation in Florida and one of the highest international designations for someone who holds the office of Property Appraiser. 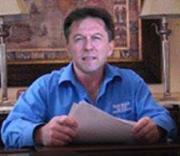 In the Property Appraiser’s Office, Jacks has held positions at every level. Prior to her election, she was the Chief Deputy Property Appraiser, where she focused her efforts on hiring professional and technical staff with the highest industry credentials, implementing budget reductions and overseeing effective management information systems. Among her most notable accomplishments is the creation of the award-winning Property Appraiser’s Public Access (PAPA) website, the go-to tool for business, industry and government to access property data. It’s free and it’s available 24/7, as is PAPA Mobile, the browser-based tool for mobile devices. In addition to her strong technical experience, Jacks brings to the office a reputation as a proven industry and community leader. Her expertise in property appraisal, assessment administration, tax law and government jurisdiction operations has earned Jacks regional, national and worldwide recognition as a leader in her field. She is currently serving as President of the International Association of Assessing Officers (IAAO), a 7,000-member worldwide organization of professional assessing and appraising officials. She also is a past president of the Florida Chapter of IAAO. Jacks’ reputation as a strong leader is also evident in her community. She is a board member of the Economic Forum of Palm Beach County and the Women’s Foundation of Palm Beach County, and an active alumnus and former board member of Leadership Palm Beach County. She has served as president of Executive Women of the Palm Beaches and president of the Friends of the Mandel Public Library. She is also a former member of the City of West Palm Beach Zoning Board of Appeals. Ms. Jacks’ key initiatives for the Property Appraiser’s Office are focused on producing a fair and equitable tax roll, broadening the efficiency of the office, embracing new and innovative technology, enhancing community outreach and increasing exceptional customer service for all taxpayers in Palm Beach County. Ms. Jacks received a bachelor’s degree in political science from the University of Florida. 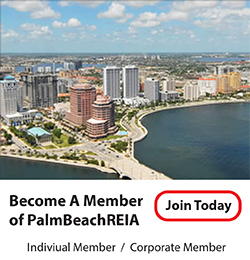 Join The Palm Beach REIA Only $129.00 Annually or ask about a Corporate Membership. that specializes in the multifamily housing sector. 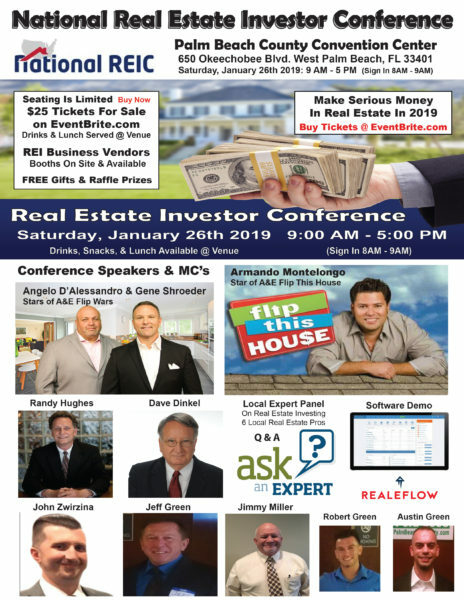 Buy Your Tickets Before They Are Sold Out, 4 Real Estate Investment Clubs Participating. Hope To See You All There. This Is An Event You Don’t Wanna Miss, So Get Your Tickets While Their Available.